Medical device packaging designer and thermoformer Barger (Elkart, IN) has received a prestigious AmeriStar award in the medical device category from the Institute of Packaging Professionals (IOPP; Oakbrook Terrace, IL). Its fifth AmeriStar award in four years, the company was recognized for the design of intuitive PETG thermoformed packaging that protects the NorthStar Medical Radioisotopes Radiogenix Isotope Separation System during its full life cycle. The packaging assembly is designed to hold and protect product contents during shipping and handling as well as during use. As an integral component of NorthStar Medical Radioisotopes’ technetium-99m generation process, the package and product work together to create critical and commonly used isotopes for use in medical diagnostic and imaging procedures. 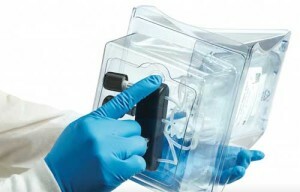 After use, the package holding depleted product consisting of three liquid reagent bags, one being caustic, tubing and couplers are discarded together, ensuring handler safety while providing functionality, ease of use and disposal. A division of Placon, Barger is certified to ISO 9001 and ISO 13485. Located strategically near Warsaw, IN, known as the orthopedics capital of the world, Barger has more than 40 years of custom pharmaceutical and medical packaging experience. The company offers design, cleanroom prototyping, tooling and thermoforming services and produces turnkey, non-sterile and sterile barrier packaging systems out of its Madison, WI, and Elkhart facilities.